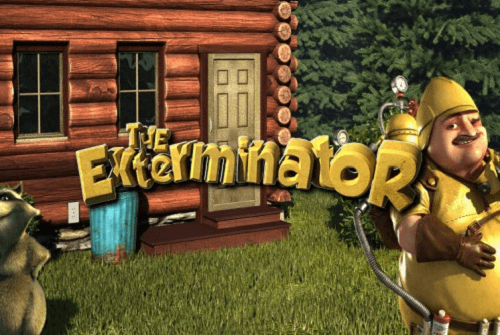 The Exterminator is a thrilling BetSoft online pokie game. It tells a story off a critter-killer who’s on a mission to get rid of a conniving raccoon. The slot features five-reels, three rows and 30 paylines. Aussies stand a chance to win big on The Exterminator pokie with numerous bonus features. You can play the pokie game online for free or for real money. 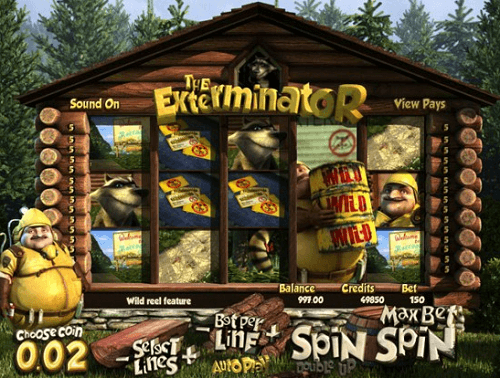 The Exterminator pokie has a Sticky Win feature; once activated a winning combo is stuck on the reels – while the rest of the other reels re-spin. In addition, the feature allows for more winning symbols to stick on the reels. Landing a truck icon unlocks the Wild reel feature. The feature sticks the Wild symbols and re-spins the rest of the reels. The mission to get rid of the bad raccoon and other animals begins when players trigger five or more footprint symbols. During the Great Raccoon Chase Free Spins round, Australian pokie players can multiply their payouts up to x5. As mentioned earlier, the pokie game has several bonus features. Trigger five or more blueprints to go onto the Bonus Game Round where you get to choose where you think the raccoon might be hiding. If you guess correctly, the prize is all yours. Choose Coin – Lets you select your base coin size. Bet Per Line – Allows you to choose your wager on each payline. Select Lines – Lets you select the number of active paylines. Spin – Play with your selected wager. Autoplay – Spin the reels without interruption. The betting range on The Exterminator ranges from 2 cents up to AU$75. The jackpot on the pokie game is 2 500 coins. The Exterminator is a great online slot game for Australian players. With the many bonus features, players stand a great chance to win big when playing the pokies game online. Get rid of pesky vermin in The Exterminator at the best Australian casinos listed on our site.